It is 1939. Nazi Germany. The country is holding it’s breath. Death has never been busier, and i will become busier still. By her brother’s graveside, Liesel Meminger’s life is changed when she picks up a single object, partially hidden in the snow. It is The Gravedigger’s Handbook, left there by accident, and it is her first act of book thievery. So begins a love affair with books and words, as Liesel, with the help of her accordion-playing foster father, learns to read. Soon she is stealing books from Nai book-burnings, the mayor’s wife’s library, wherever there are books to be found. 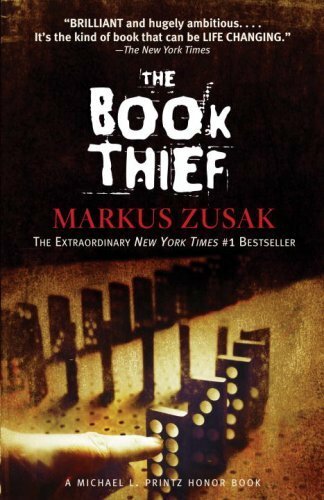 After hearing great things about The Book Thief from many people, I decided to get it and see what all the hype was about. The summary on the back of the book sort of interested me and at the same time made me a little iffy on getting it, but I did. I have to say, though, that I really did like this book. Zusak uses Death as the narrator for the whole story which gives people a new look on World War II and the people who lived during it. This was one of the reasons why I liked this book and kept on reading. The relationships between Liesel and her foster parents seemed truly genuine and not cliche or cheesy. This was the same with her relationships with every character she encountered, not to mention her very good friend, Rudy Steiner. The book covers a span of four years or so, therefore making the book not flow like a lot of other books in which they cover an amount of three to five days or so. Nevertheless, this is another reason why this book is so unique. The only problem that there was in this book for me is that there were some parts that were hard for me to follow, but that never took away much from the book at all. I recommend that you read this book. I hope that you wll enjoy it as much as I did. Zusak has another book out called, I am the Messenger, which I would like to get sometime in the near future.